Mountain-Style Log Sided Home w/Beautiful Long Distance Valley View! Quiet & private,this home's rustic elegance is so inviting & comfortable. The great room has a gorgeous stone fireplace w/Xtrordinair wood-burning insert(the best), wood floors, high vaulted cedar ceilings & a wall of windows that offers a view over the tree tops all the way to the valley floor. Kitchen is well appointed & features Knotty Alder cabinets, granite counter tops,large granite island, gas cook top, microwave/convection combo, warming drawer, new Kitchenaid refrigerator, new Kitchenaid dish washer & large pantry. Master suite is stunning w/private balcony, stone gas fireplace, jetted tub, dual-head shower, elegant double vanity. Downstairs are two spacious bedrooms, a beautiful full bath & game room. Upstairs is an open loft w/ media entertainment area & pool table. Separate guest suite with bath is darling! 3 garage spaces, Backs open space. 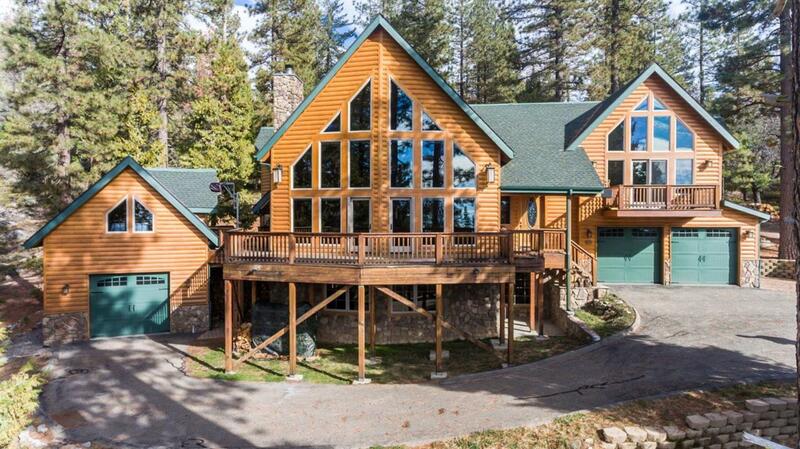 Listing provided courtesy of Tamara Myers of Pinnacle Real Estate Of Shaver Lake.